In 2006, after years of increasing concern, Mr. Marshall, with the help of many others, sought a petition for guardianship (which was awarded) for his grandmother, Brooke Astor, who was a victim of elder abuse by her son, Philip’s father. The story was chronicled nationally by the press due to Mrs. Astor's recognition, the nature of allegations indicated in the petition, and events culminating in a six-month criminal trial of Mr. Marshall's father and one of his grandmother’s lawyers. Through her life, Brooke Astor was known for her decades of philanthropic work in New York, earning her the Presidential Medal of Freedom in 1998 from President Clinton. How her sad circumstances have spurred a greater recognition of elder abuse. As active elder for half a century, how Mrs. Astor's life exemplifies ways our last decades can be so purposeful and filled with philanthropy—an engaged "love of humanity." Mr. Marshall now tell his story and works to help the greater cause of elder justice. Philip Marshall has been teaching and practicing in the field of historic preservation for over thirty years. He has held faculty positions at Columbia University, the University of Vermont, and Roger Williams University where serves as professor emeritus and (immediate past) director of the historic preservation program. His consulting includes work with the Hopi Nation in Arizona; the Tibetan community in America; and federal and state agencies, museums, and other nonprofit organizations. He serves on boards and committees of national, state, and local organizations. 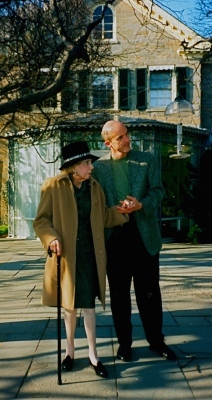 Brooke Astor and Philip Marshall at Holly Hill, her country house in Briarcliff, New York. 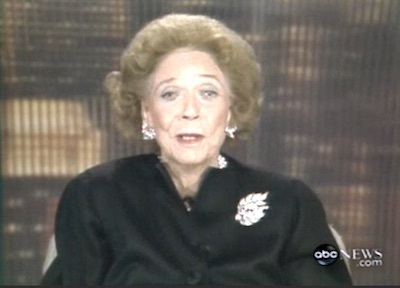 Video of Barbara Walters's interview with Brooke Astor at 91 , ABC News.